2018 was the year I fell in love with Tahereh Mafi’s books and writing style. A Very Large Expanse of Sea was no exception. I started this book and was unable to put it down. It filled my heart and just made me want to explode. It truly had one of the best romances I have ever read and I am still reeling from it. Tahereh Mafi has said that this book is semi-autobiographical which I feel just highlights the importance of this story. A Very Large Expanse of Sea is both raw and filled with hope. It was a book that dived into an unexplored topic in an authentic way, surely motivated by the authors own personal experiences with the topic. A Very Large Expanse of Sea is set in 2002 just a year after the tragic events of 9/11. Shirin a 16-year-old Muslim girl who wears the hijab is the daughter of two Persian immigrants who have made America their home. Unfortunately, the Islamophobia is rampant, especially with the fact that Shirin and her family move quite regularly which makes it difficult to settle into a small town let alone wait for people to get over their prejudices. Shirin just wants people to see her for her, to understand that she isn’t oppressed. Due to this, she does have some sharp edges that honestly made me love her so much more. A romance is interwoven into this story and it is the sweetest thing ever, with Ocean being a shy and nervous guy who desperately wants to know Shirin better. I did have some problems with this relationship, mainly that at times I was unsure if Shirin was really attracted to Ocean – and he was a tad annoying on occasion. I feel it is important to mention that I am white. I don’t understand what it is like to be oppressed nor what it is like to experience racism. This book made me check my white privilege about a hundred times though. I found two own voices reviews which you can find here and here. They discuss particular topics that I didn’t notice throughout the book and provided a new insight to me. If you have an own voices review you would like me to link, feel free to comment because I’d love to boost your post! This book could have definitely had more breakdancing than romance, but it was very clearly a contemporary at its core and those typically focus on romance – or typically do in my reading experience. I also loved the sibling relationship between Shirin and Navid – additionally, I loved the inclusions of his friends too. Navid went out of his way to involve Shirin and invite her to participate in activities such as the break dancing group at the school that I thought was great. 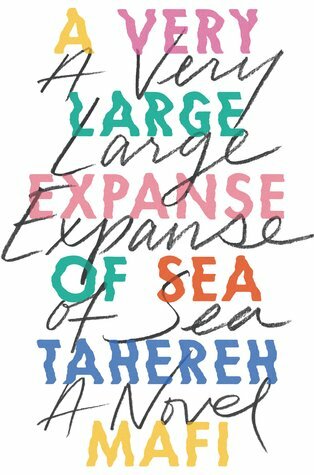 A Very Large Expanse of Sea was a book that made me feel so many different things, however, it definitely could have been longer so the focus wouldn’t have been solely on the romance. After reading some own voices reviews I definitely see the flaws that are among the book but I truly enjoyed it too much to bump my review rating down. I recently bought this as a Christmas gift for someone so I’m glad to hear that it was well-liked! I read this book when it came out and loved it! So glad you enjoyed it too! Navid and his friends’ friendship with Shirin was one of my favorite parts of the novel. Also the way her family always sat down to have a traditional dinner together — it was so adorable! I loved this review! I do wish there was a little more break dancing but I did still really enjoy this book! and glad you enjoyed this one! YES to this. Same, same, same. Some of the things she experienced were things I honestly tend to forget even happen to actual human beings, and it hurt my heart and reminded me that, no matter how much I might try to be a good ally, at the end of the day, I will NEVER fully understand what people of color go through in this world.